This quietly revolutionary guidebook picks up where the bestselling Process Self-reliance series’ The Urban Homestead left off and brings us into the kitchen, where the daily choices we make involving food have a profound impact both on our lives and the world at large. Author Deborah Eden Tull draws on years of experience as an organic gardener and cook, a sustainability coach, and a Zen Buddhist monk to introduce simple but life-changing ways for urbanites to adopt a mindful and sustainable relationship with foodfrom shopping, menu planning, cooking, growing, and storing food, maintaining the kitchen, and eating out, to community food sharing and tips for parents. Beautifully illustrated, practical and fun, this book is filled with anecdotes and step-by-step instructions to inspire neophytes and experienced homesteaders alike. 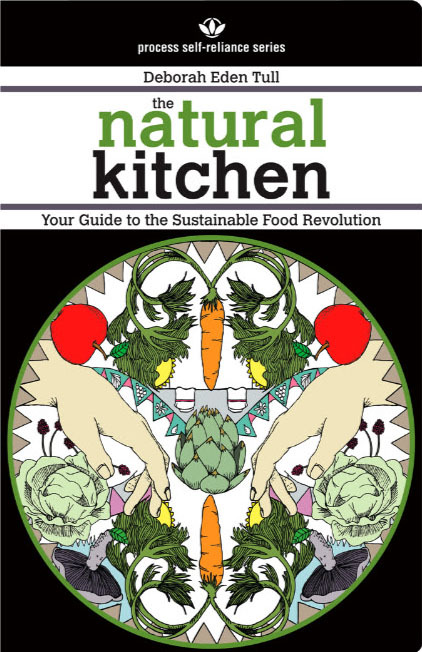 The Natural Kitchen‘s introspective and educational journey will inspire action and change forever the way readers relate to food, the environment, and their daily lives. Deborah Eden Tull is a sustainability consultant who has been traveling to, living in, or teaching about sustainable communities internationally for the last 17 years, including seven years as a monk at the Zen Monastery Peace Center. She teaches workshops throughout Los Angeles County, and is certified in Permaculture Design, Bio-Intensive Organic Gardening, and Compost Education. Her approach to sustainable living is a unique combination of peace and environmentalism that emphasizes the interconnection between personal and planetary wellbeing.